It’s birthday season here, so let’s talk about cake. I’m a yellow-cake-and-chocolate-frosting devotee, but I can also be talked into chocolate cake paired with cream cheese frosting. And a moist chocolate cake baked in a Bundt pan and served with the barest sifting of confectioner’s sugar is something one might find on our counter with some regularity. I have what might be considered to be unconventional opinions regarding frosting. Apparently, many people view cake primarily as a vehicle for frosting, whereas I prefer frosting to be a mere slick of contrast to the flavor and texture of the cake. This old-fashioned little cake, included in a set of “lost” recipes compiled by the folks over at America’s Test Kitchen, seemed like it would hit all my sweet spots: pantry ingredients, no fussy egg white beating, frosting that becomes almost part of the cake itself, casual enough to be served straight from the pan. It’s an everyday cake, with Southern, Depression-era roots, and yet it appeared to have a modern, shabby-chic appeal. I had to give it a try. So far, this has served well as dessert, breakfast (I know, I know … I said no more sweets for breakfast, but this was the only thing that made The Lad’s enthusiasm for the pre-Today Show hours bearable this morning), and mid-afternoon snack. And I dig the vintage appeal of it – adding it to my recipe book makes me feel like I’m participating in some kind of historical preservation. Adjust an oven rack to the middle position and heat the oven to 350-degrees F. Grease and flour a 13 by 9-inch broiler-safe (metal) baking pan. Whisk the flour, baking powder, and salt in a large bowl. Heat the butter and milk in a medium saucepan over medium heat until the butter melts. Stir in the vanilla. Meanwhile, beat the eggs and granulated sugar on medium-high speed with a hand mixer (or in a stand mixer) until pale and thick, about 4 to 6 minutes. Fold in the flour mixture in two batches, stirring just until incorporated, and then stir in the milk mixture until blended. Pour the batter into the pan and bake until a toothpick inserted in the center comes out clean, 30 to 35 minutes. Let cool a bit in the pan – about 10 minutes. While the cake is resting, preheat the broiler, keeping the rack at the middle position. 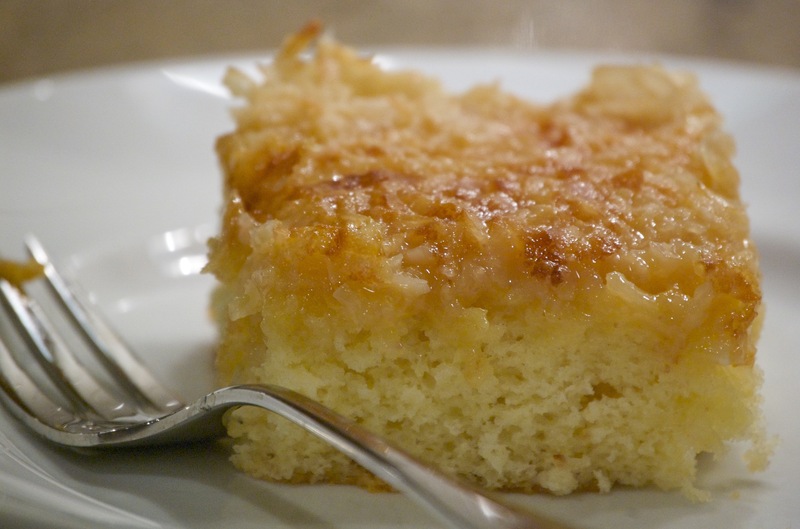 Prepare the icing by combining the butter, brown sugar, sweetened condensed milk, and coconut in a medium bowl. Spread the topping evenly over the cake and Broil until the topping bubbles and just begins to brown – 2 to 3 minutes. Serve warm or store, covered, at room temperature, reheating slices in the microwave for about 30 seconds.